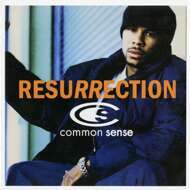 Common's "Resurrection" is the title track to Common’s sophomore album which hit in late 1994, but these two songs have never been released together in this configuration , either on 12-inch or 7-inch. Both cuts are Large Professor remixes of the album version. The A-side is the “Extra P” remix of the song and the B-side is the “Large Professor remix”.